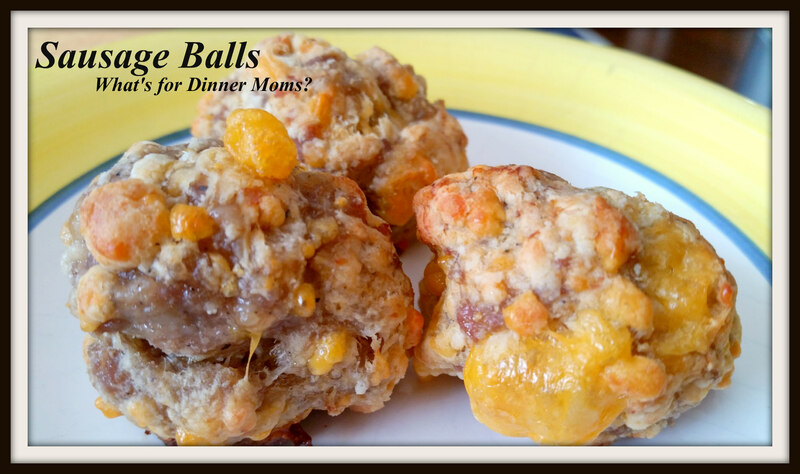 Bisquick Sausage Balls – What's for Dinner Moms? Getting ready for football games this weekend? We love football and appetizers in our house. I try to change them up each week adding one or two new ones to our usual staples of dips and wings. When I read about the Sausage Balls I was a bit skeptical. I love sausage but Bisquick and cheddar cheese? It sounded weird. I actually went out and bought Bisquick to make these. *Please note I am not compensated in any way by Bisquick. I bought the product and all thoughts and opinions are my own. The kids LOVED these. I thought they were good. They were better with a mustard dip. These are a heavy appetizer. I made the first batch into about 1″ balls but they were really too much. The rest of the batch I cut down to 1/2″ balls. This made about 48 bites. Preheat oven to 350 degrees. Grease a rimmed baking sheet. Stir together all ingredients until well blended. Roll into 1/2″ or 1″ balls and place on baking sheet. Bake 20-23 minutes until browned. Remove immediately from pan and serve with dipping sauce. Next Post What is Your Song? We always use red pepper flakes…they are always a hit. My son would love that! Wow looks really good Marci! I always saw your thumbnail in likes. I really liked your name and i couldn’t click your thumbnail. But as I browsed blogs i saw koolaid moms. Your blog is just as awesome! Glad I found it. Glad your here! Wonder why you couldn’t get to it? Hmmm. Thanks for letting me know. Love these around Christmas. I usually make one batch plain and one batch with green olives in the middle. So yummy! Hmmm, olives… My kids would love that. Looking yummy as usual Marci! I am back from vacay, I am sure you cooked up a storm this past week! Lol. I am trying. The little engine that could…. Thank you! That would be a great idea. I probably shouldn’t do both together, too fattening, maybe eggs and muffins,but it sounds so good right now! Hi there, what is Bisquick? I’m from outside the US but I wonder if there is some equivalent I could use instead as they do sound nice.